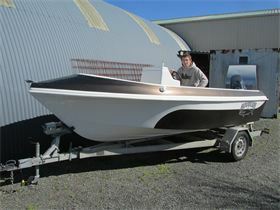 Lifestyle Yachts is currently designing and building its own Bluewater Series of trailer powerboats. The 4.3 is a very usable big volume small boat. A very stable wide body boat giving plenty of room for multiple fishers. The center console has room for all electronics and a storage locker in the fwd seat. The aft seat houses the battery and optional live bait tank. Lifestyle is working with Suzuki to put together a package deal to offer to the public. Pricing will be avaliable soon. The Bluewater Cruiser is 7.6m with a raised bow. This will be a very dry boat that will perform very well in heavy seas. The raised bow also allows for a huge fwd accommodation area. There is sleeping for four people, a fold away galley and enclosed private toilet. The cockpit has plenty of room for fishing and diving. The large boarding platform makes swiming easy and safe. Easy access to the large open fwd deck makes every part of this boat usable. A feature that is not offered by any other manufacturer in this size of boat. The Sport Fisher has the same hull as the Bluewater Cruiser. With a full walkaround it makes fishing easy from any position on the boat. The huge cockpit gives plenty of room for eight and more people to fish in comfort. A small cabin fwd allows for an overnight stay. This another of Ron’s T11 planning hulls this time the boat has been extended to 12.5m and Widened to 5 meters. The vessel is designed to be a family boat capable of off shore fishing and motoring to the pacific islands. Sleeping for eight in three cabins, the owners has its own toilet with shower toilet area in the aft stb hull. There is a well set up galley on the bridge deck with wrap around dinette opposite. The boat has a lower helm with a second helm on the fly bridge and third set of engine controls in the cockpit. The offshore tender is housed behind the helm on the fly bridge with a 10hp Honda outboard. There is an extensive bait station in the transom with tuna tubes and large live bait tank with viewing window. Beside these is a large sink with salt and fresh water. Fwd in the cockpit is a large deep freeze for fish and food on long passages. The boat is powered with twin 240hp Yanmar diesels on conventional shafts. There is a water maker on board and upgraded alternator to keep the Lithium batteries topped up. The boat carries 1200lts of fuel with areas in the hulls aft to carry bladder tanks. Lifestyle Yachts Ltd is owned and operated by Aaron Beattie, a qualified boat builder with over 28 years experience. Copyright © 2019 All Rights Reserved by Lifestyle Yacht Ltd.